Hamilton seo is probably one of the toughest on-line marketing strategies to implement. This is partly because of Google’s strict local algorithm, which takes into account several factors. Long gone are the days where you could build a large amount of links and expect your local business to rank on the first page. Link building is one of multiple factors that Google takes into consideration when placing you on the coveted first page of a local search result (7 Pack). The purpose of this article is to provide readers with quick action steps on how to place your local business at the top of the local SERPS (search engine results page). Check and see if your target keywords trigger the local algorithm (see image below). Generally speaking, key phrase combinations like city + keyword triggers a local search result (7 pack). There are still many services which do not trigger the 7 pack. If your local business is such a service, then this would make ranking a lot easier as it would rely more on the traditional SEO strategy of relevant link building versus a more localized SEO strategy (directories and citations). One of the critical steps in local search is determining where your business is geographically located. And it goes without saying, it’s always easier to rank in your local city. This is because the local Google algorithm will always give preference to businesses located within a geographical boundary (city). On-line marketers call this the “centroid” bias. This basically translates into Google giving preference to businesses located closest to the downtown area of a city. So if you are trying to rank for “Dallas hair salons” then those salons located closest to the downtown area will be given preference, all other things being equal. So if your business is located outside a metropolitan area, then ranking for that city may be a daunting task (even impossible for competitive niches). Next, determine how competitive your niche is. Take the first business that is ranking #1 in the 7 pack. Now copy the name, address and phone of this result and place quotation marks around it. For example, “XYZ business 1225 Saint Regis Drive Houston, Texas 972-781-5656.” See image below for any example. Make sure you copy the NAP exactly as it’s displayed in the 7 pack. Now put this in a Google search with quotation marks and see how many results show up. This will give you an approximate idea as to how many directories and citations you will need to outrank the top listing in the 7 pack. Repeat this process for the lowest ranked business in the 7-pack. Write down the number of results that Google shows. Now repeat the same process for your own business NAP. Your results would have to beat the lowest ranked business in the 7-pack to be included. Obviously, the quality of your backlink profile, customer reviews and various additional factors will come into play. This method is simply to gauge how much effort will be required to be included in the 7-pack. Now that you are armed with all the necessary information, its time to get to work. First step is to get listed in relevant local directories. 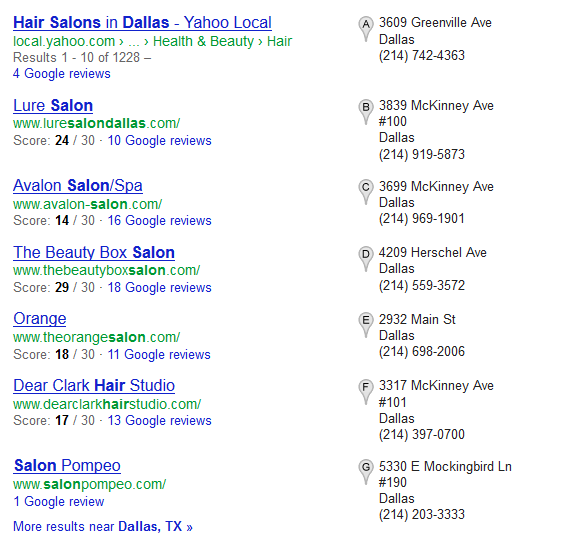 This not only means Google Places and Yelp, but also directories local to your city and specific niche. So if you’re a plumber, getting listed in the local plumbers association for your city would be a great start. The goal is to get listed in as many local directories as possible. The local Chamber of Commerce is also a great place to get listed. Even if you cannot place links, just getting a plain listing is good enough. The 2 important factors here are relevancy and of course, being local to your target city. Make sure these two factors are covered when doing directory inclusions as well. Last, but certainly not least, make sure you accurately implement NAP (name, address and phone number) of your business in all the local directories. And more importantly, make sure that all the citations have your NAP listed in exactly the same way across all the directories (including your own website). Any inaccuracies will result in a loss of valuable SEO juice. The Google algorithm may be complex, but it’s still just an algorithm. A slight variation in the NAP may signal to Google that its different business. Ensure that all your NAP’s are identical for effective optimization. This is a critical part of local SEO, which a lot of businesses seem to overlook. And there you have it. An effective local SEO strategy in 5 easy steps. Just following this simple action plan should put you on the road to higher local rankings and traffic in a short period of time. Good luck and may the SEO force be with you!